Things will not go according to plan. There will be bugs, bears and cherished items forever lost. Tears will be shed. The weather won’t cooperate. Blisters will form. We will run out of marshmallows. But that’s the whole point, right? Life never goes according to plan, but that’s what makes it interesting. We do our blessed best to make good of what we’re given, and in that shared experience we connect with each other and discover what’s really important. That’s why I like camping with family and friends. That’s why I’m organizing a series of trips to places near and far, culminating in a two-week excursion to the high desert and canyons of Utah and the mountains of Colorado. This spring we will take some weekend trips to Arkansas. We’ll canoe and fish the rivers, walk the trails and ride the roads. We’ll figure out how these tents and sleeping arrangements and various cooking implements actually work. During spring break we’ll go east to the Smokies for an extended test of our meddle. Then on Memorial Day weekend we’ll depart for the big adventure west. If this sounds like something you’d like (or maybe that you’d hate, but feel it would be a good thing nonetheless) then let’s get in touch and make some plans, if only to have them crushed beneath the great weight of mother nature. 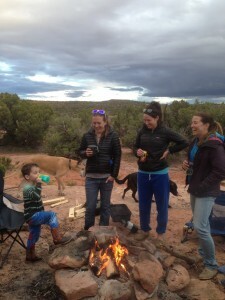 Andrew holding court fireside on BLM campsite outside Moab, Utah. One Comment to "You’re Invited"
Sounds wonderful, Taylor! I’d love to be informed. You probably don’t want old folks like us going along, though and I’m not sure we can, but would love to be on the info list.